Once again the holiday season is approaching and with it, the end of another year. It's time to reveal our top 5 most popular articles of 2016 and what you, the readers, enjoyed most. 1 The Sears Homes of Lombard -- This article blew up my website. People in Lombard sure are proud of their historic kit homes! 2 When is a Sears House Not a Sears House? -- "Franken-houses" are kit house models from one company that were built by another. This article included a house in Lombard so that may explain the popularity! 3 The Sears Westly--a Home Built Everywhere -- The Sears Westly is a house found all over the Chicago suburbs. It looks like a dollhouse to me. Is there one in your neighborhood? 4 The Prettiest Sears Lynnhaven -- Barrington has many lovely kit houses but I really like this one (and apparently the readers do too). Check back here in 2017 for more Barrington homes! 5 The Spanish Craze That Swept the Country -- "Over the whole country Spanish architecture has cast its spell." During the 1920's, the popularity of Spanish Revival architecture peaked, and the kit house manufacturers embraced the trend. We invite you to join us in 2017 and see even more Sears homes in Chicagoland. Happy Holidays! A Sears Vallonia in full winter regalia. Photo from Pinterest. 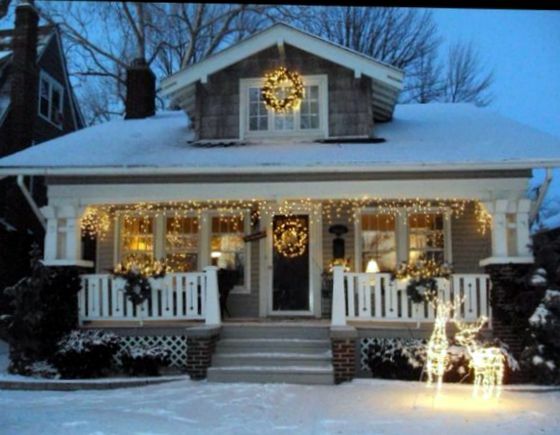 For the Sears house connection to "A Christmas Story", click here! My son just purchased a "1926 Sears Crescent home" in Mt Prospect IL. Is there a way to authenticate it? I'll be happy to help him authenticate it. Just email me using the pink button at the top of the page.